Looking for a climbing harness? Check out our Buyers Guide! 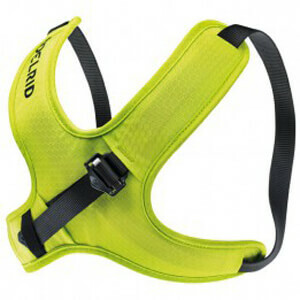 The chest harness supports stability of the upper body. You can use it together with a sit harness. It shifts your center of gravity from your hips to your chest and thereby prevents your body from turning over. A chest harness is particularly useful for kids because their upper body tends to be significantly heavier than their legs. The same applies to people who are climbing with a backpack. Apart from that it is an important addition for climbers who don't have very pronounced hips. They have a higher general risk of slipping out of the sit harness in the event of a fall. This is especially the case with children, very slim individuals and overweight individuals. What types of chest harnesses are available? Chest harnesses are available in two different shapes: the figure eight shape and the suspenders shape. Modern chest harnesses are fully adjustable and can be worn comfortably under a backpack. They provide an additional measure of safety for via ferratas, glacier hiking, mountaineering and climbing. Caution: Chest harnesses must never be used alone, only in combination with a sit harness!